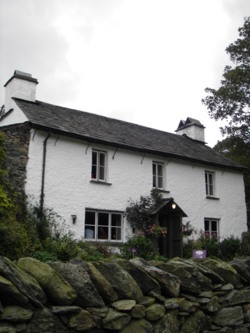 Yew Tree Farm with its distinctive �spinning gallery� is in the beautiful Coniston area of the Lake District, in a unique picturesque setting it is ideally located for all Lakeland activities. The Farm was named after a Yew tree that was 700 years old when it was felled in 1896. The Farm House is a 17th Century Cruck-frame farmhouse added to in the 18th Century and is one of the most photographed farms in the Lake District. The Land comprises of 500 Acres of meadow, pasture and fell and supports both beef cattle and sheep. The Farm was saved from the threat of developers when in 1930 Beatrix Potter purchased it as Part of the large Monk Coniston Estate. In hard economic times Beatrix Potter encouraged her tenants to welcome visitors and at her own expense helped them in this by setting up a small tea room in the dining room of the house, furnishing it with antique furniture she bought locally. At Yew Tree Farm we offer a special experience, a very warm welcome awaits. The farms quality meat was disappearing in the mass food chain alongside meat of varying quality. With support from the National Trust, Leader+ and Distinctly Cumbrian they set up Heritage Meats to provide consumers with the opportunity to purchase their naturally reared meat directly from the farm. An enchanting love story inspired by the life of Beatrix Potter - the most successful children�s author of all time. Set in London and the Lake District in 1902, the film "Miss Potter" stars Academy Award winner Renée Zellweger as Beatrix Potter, and charts the developments of her early career and views on the world as she opens her eyes to the true nature of her relationship with her publisher, Norman Warne (Ewan McGregor). Yew Tree Farm was used as the location for her Lake District Farm - Hill Top. Please mention Adventure 21 when inquiring about this accommodation.